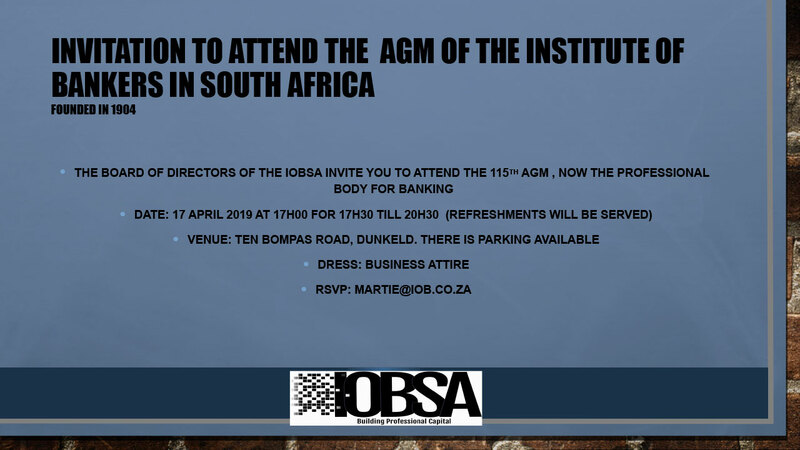 The IOBSA has a respectable history as the second oldest Institute of Banking in the world and was established in 1904. The Institute has a history and relationship with the banking and financial services sector spanning 110 years. “Its main objective has been the promotion of efficiency through education and continuing professional development in the banking industry in general and of its members in particular. The Institute registered five (5) professional designations in its capacity as Professional Body. Applicants Wishing To Obtain A Critical Skills Visa Letter And Permanent Residence Letter. The AGM will be held on the 16th August 2018 at 17h00 for 17h30 at the Wanderers Club, North Road, Illovo. Our Keynote Speaker will be Deputy Governor Kuben Naidoo of the South African Reserve Bank.